Forget cookies. Schools, churches, and non-profits can raise money and make a real difference to the environment and their local community by promoting reuse of used cardboard boxes. BoxCycle, the first full-service marketplace for used boxes, introduces new programs that make it easy for non-profits to turn garbage into gold. San Francisco, CA (PRWEB) February 27, 2009 - Green fundraising lets non-profits help the environment as they raise money for their cause. Used boxes are perfect for socially conscious fundraising. Every box that is reused saves energy, water, trees, and landfill space. Nearly every organization needs to get rid of their boxes and many people are looking for cheap boxes for moving and shipping. BoxCycle (http://www.boxcycle.com) connects buyers and sellers through the first full-service marketplace for used boxes and makes selling boxes simple and profitable - perfect for organizations looking to make a difference. BoxCycle introduces two new ways for schools, churches, and non-profits to raise money with used boxes. First, they can sell their own unneeded boxes on BoxCycle. BoxCycle's new non-profit program will add an extra 10% to their earnings. Organizations can increase their volume by collecting boxes, or serving as a drop-off point for others, in their neighborhood. "Schools often have the space to store boxes and the motivation to reduce waste and set a good example. They can become a reliable source for environmentally friendly boxes in their neighborhood while raising money for their causes." says Ilia Gimelfarb, BoxCycle Founder. Another new way to raise money is to sign up box sellers. 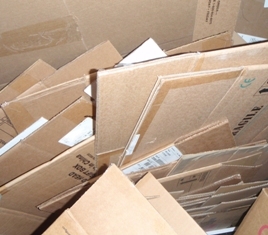 Offices and businesses are looking for ways to get rid of their boxes in an environmentally friendly way. BoxCycle makes this easy and profitable, but few are aware of the service. Non-profits who sign up new sellers are now eligible for up to 10% of all box revenues generated by those sellers. Both seller recruiting and selling boxes directly are easy to combine with existing fundraising activities. Organizations earn more from their efforts and make a real difference to the environment and their community. Ilia Gimelfarb concludes, "Schools, churches, and non-profits are full of energetic people looking to make a real difference. They often see fundraising as an unfortunate necessity. Our new programs turn it into something that directly changes the world." BoxCycle is the first full-service marketplace for used boxes created to make the environmentally superior option of reusing shipping and moving boxes practical, convenient, and worthwhile.